People in Goa are prone to complaining about how the rich and famous do not pull their weight and do something for society. In turn, Green Goa Works is a challenge to the very same critics and naysayers to do their bit instead of indulging in all talk and no action. It is a non-profit company that has Wendell Rodricks as its chairperson, renowned architects Kamlakar Sadale, Sarto Almeida and Dean D’Cruz, and prominent businessman from Mapuça, Idrees Haaziq, as its founders and collaborators. Green Goa Works was established in 2003 to combat issues detrimental to Goa’s ecology and environment. Claude Alvares, who is the director of the Goa Foundation and a member of the Supreme Court Monitoring Committee on Hazardous Wastes, is the working director of Green Goa Works. The managing director of the company is a well-known businessman from Dona Paula, Captain Leo Lobo. These are people who found their common ground in safeguarding the environment of Goa. There has been no advertising to promote the company and its presence has been made known by word of mouth. This is one of the reasons for the company having a selected and limited clientele. The other reason is that very few people will take the time and effort to make the lifestyle changes required to contribute to saving the environment. Green Goa Works offers its waste management services at a low cost and will act only upon invitation. It has a shop stocked up entirely on the demand of eco- friendly products. Some of these products are brought in from Karnataka. There is organically produced rice, wheat and other grain; so also you find honey, soap, oil, and shampoos. Osolin Research Laboratories, Bangalore, provides the Green Goa Works shop with products such as Bugsac-d9, Meali-Sac and Pynodor. These function as cleaning products, deodorisers and insect repellents. They are organically derived, safe and extremely effective, departing from the toxicity of the high profile brands promoted on television. Huge earthern barrel composters are sold with detailed instructions on how to use them. One can obtain compost directly from the shop too. Though the process of composting may seem tedious, all it requires is a little patience and a genuine zeal to do something for the preservation of the environment. EM is a phenomenal elixir of life, so to speak, which has the ability to work its magic treating a wide range of environment related problems from ‘garbage to guts’. The abbreviation expands as Effective Micro-organism. These compatible micro-organisms are selected from the natural environment of a region and are not genetically engineered. 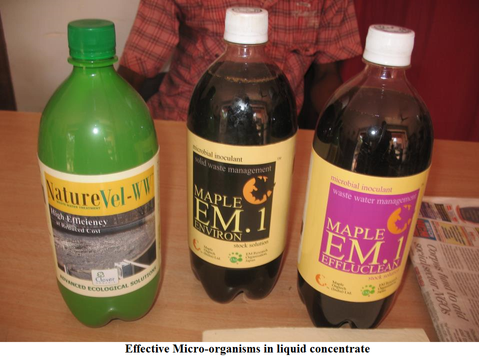 EM is liquid concentrate which is then activated (known as AEM or Activated Effective Micro-organism) using molasses, jaggery syrup or water from rice washing, and effectively destroys harmful microbes. AEM can be utilised to clean toilets, bathrooms, floors, treat garbage, clear up algae and moss in water tanks and soak pits and decimate pests that destroy crops. This amazing liquid can furthermore be safely used to bathe pets, wash clothes, and in a minute quantity, cure an ailing digestive system. AEM can be stored for about forty five days as there is a gradual decline in the microbial population over time. Both EM and AEM are available at the Green Goa Works shop. Espie Kandolkar leads the Green Goa Works team in Khorlim, Mapuça. From being sardonic about the passion of nature lovers, Espie has become a vociferous advocate of environment protection. She does not mince words in her critique of the lackadaisical attitude of the public and the government. She began with writing reports on the disposal and treatment of hotel waste in Anjuna, but was soon drawn deeper into understanding the various processes involved. She recalls the period spent in Pondicherry after the devastating tsunami of 2004 had rendered the soil extremely saline in nature. She was at the Aurobindo Ashram, when the woman who was talking to her became highly animated while relating that weeds had begun to grow on their land. Espie found her exuberance rather silly then. However, when she sat down to compile her report it struck her that the presence of the weeds denoted the regained fertility of the soil and this was the cause of the woman’s ecstatic outburst. At the ashram, they had toiled doggedly to restore the fertility of the land by creating soil, layer by layer, through the addition of burned natural waste material (bits of wood, etc.). One of the extensive projects undertaken by Green Goa Works has been the clearing of the infamous Sonsoddo garbage dump. The company will not, however, consider taking on the task again because of corruption and bribery within the government. It specialises in turning garbage and waste into productive material and hence collects the same from Mapuça market, e.g. meat and fish waste. Fish manure is a particularly saleable item as it is required for healthy growth of coconut trees. The company helps people generate gas from household organic waste. When it comes to recycling, Espie is sceptical as she says, ‘Even with recycling – what exactly happens later?’ She suggests most recyclable items make their way to landfills. Then there are products like diapers and sanitary napkins that can neither be burned nor recycled, creating a nuisance everywhere they are strewn. The quality of education received is ostensibly reflected in the behaviour of these degree holders. ‘There are people who do not know how a seed germinates!’ exclaims Espie. ‘People don’t consider that when a forest can grow without the help of artificial fertilisers and pesticides, why can’t their crops,’ she continues. They may use additives to boost growth for commercial purposes but eventually they would pay for it through the soil’s loss of fertility. ‘It is more difficult to work with the educated people. You can wake up a sleeping person, not someone who is awake.’ She asserts they contribute to the problem with their reluctance to bring about a change in their lifestyle. They gladly transfer the responsibility entirely onto the government and then complain about the inefficiency. The easiest solution would be to go back to simple living. Unfortunately, this process of reversion has become very difficult. ‘It is high time we start rebuilding and making a change. We are destroying everything all over the world!’ rues Espie. Green Goa Works provides easy solutions one can put to use with simple techniques. The time to begin the change is now and it starts with each one of us. Do we possess the unselfish attitude that will allow us to jumpstart this transformation? Green Goa Works is assuredly a beacon to guide us towards a green solution to save our planet.